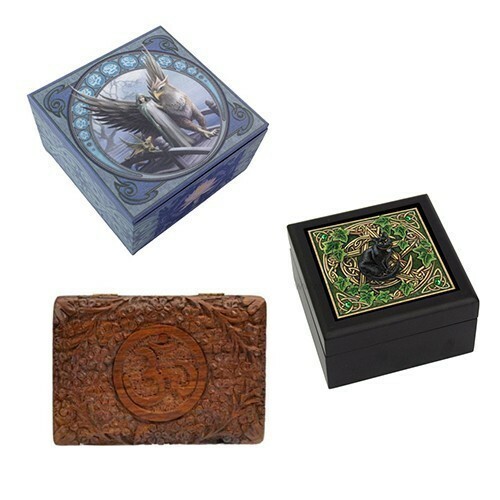 This Binding Box binds vessels (empty, enchanted and/or spirited) with spells for Aligning You with Your Greatest Fate, Revealing Important Destiny Paths & Information, Giving You Hope & Faith for a Powerful Future, and Embracing You With Paranormal Power for Supernatural Development! You can bind the spells temporarily or permanently and it comes with easy-to-follow instructions so you can make charms for yourself, friends or family! It does not need recharging and you can make as many as you want and can bind multiple vessels at one time! This binding comes with easy-to-follow instructions for usage. You will receive these instructions with the binding in your package. You can choose in which Arts you would like your binding. White Arts is positive energy which works without any dark influence at all. Dark Arts is dark energy which works for those who indulge the darker side, but is not Black Arts. Neutral Arts means the binding is completely neutral and can be applied through White Arts or Dark Arts, if desired. There are no further discounts to this item because of the work involved.